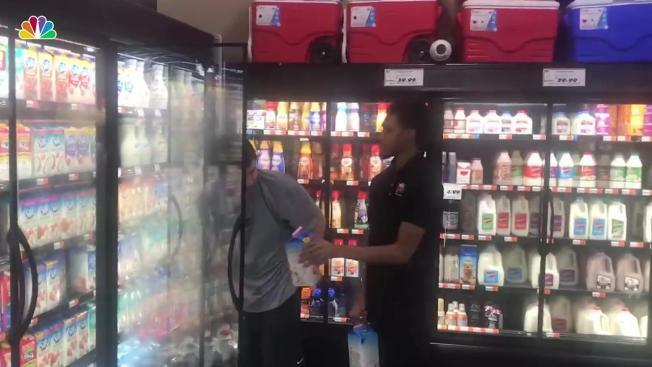 "This young man took the time to slow down and allow Jack Ryan to help for over 30 minutes, guiding him as he finished his task"
A Facebook user posted video of her brother, who has autism, stocking grocery store shelves with a store employee. She said the employee, identified as Jordan, took time to show her brother what to do. Sometimes it only takes a little kindness to make a miracle happen. Delaney Edwards Alwosaibi shared a video on Facebook that her father took at their local supermarket, Rouses Markets, in Baton Rouge, Louisiana. The video shows an employee helping Alwosaibi's brother Jack Ryan, who has autism, stock shelves. She said Ryan showed interest in stocking the juices and milks after watching an employee identified as Jordan, who showed him what to do. "We all know autism makes going out difficult, and sometimes grocery stores can be a challenge," Alwosaibi wrote. "This young man took the time to slow down and allow Jack Ryan to help for over 30 minutes, guiding him as he finished his task. He could have ignored him. He could have made an excuse and said he couldn’t allow him to help." Her father described the situation in the video as "a miracle in action."